Ro'meph slowly rose up and slowly scanned sand all around him. His mind still fuzzy from the sleep he wasn't sure if he was dreaming, when the sleep began he was surrounded by vast cities. Now he could tell it was all gone, somewhere below him or altogether gone. taking a few steps he realized the sand was falling from where flesh should had been. what had happened he was once a guardian, bound by pact to his sacred duty of guarding his king, and to answer the call of Settra when the time came, now it seems that call had been made. then he felt the pull, just off to his left his brother was crawling out of the sand and all around him the same thing, His King was calling and the army was rising. Placing aside his Tomb Blade the Ushabti began to dig, his King had been sealed in the tomb a long time, now he wanted out. So just starting the tomb kings, just doing on ushabti this month and a pegaus knight which fluff may be following. This first post will also contained my completed works pics starting with april, and my point totals for my goal of 141,000 before september. Last edited by Lakomasoi on Wed Apr 27, 2011 11:07 pm, edited 5 times in total. I'm looking forward to seeing a Tomb Kings army. Hopefully they'll see an update this year! Looking good so far, though I think there is too much brown on the Pegasus. I find myself thinking Hawk Wings....the painting is good, I guess I just don't care for that much brown. I'm going to blame it squarely on seeing the original Clash of the Titans in the theatre and having my young mind blown. Beginning Steps on painting my Ushabti. Made a lot of progress so im quite happy with three hours of work. So im calling him done, i want to wait on basing until i get some more bits maybe a skull or two something like that. but he is done for now. that came out quite nicely there fitzy, is this the second one u have done tho? cause i swear i saw one of these painted like that at the game store a couple weeks back. i really enjoy the orange and blue highlights, and its nice because they dont take away from the other cloth colors or the black skin. 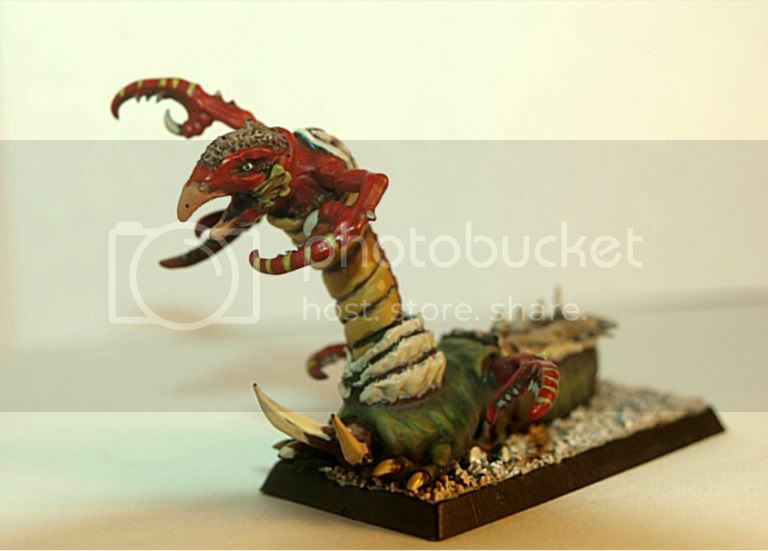 if u are going to paint the whole army to this level its is going to be bad A**.